If you’re looking at the datestamps on this blog, you have probably quite quickly realized that it is no longer active. I never really made a decision to stop posting here, but instead found that I just didn’t have the time to post regularly and was having trouble maintaining enough interest in the Ottawa Project to make it worthwhile. But today, I decided that I should probably write this long-overdue farewell. I have every intent of leaving all of the posts I’ve made up as an archive, but in all likelihood, there won’t be any further posts here (if that wasn’t already self-evident). I’m still active online, such as on my Twitter, I can occasionally be found commenting on urban issues over at Open File Ottawa, and I’m in the process of getting a personal blog going as part of a requirement for a public relations class I’m taking. Finally, if you’ve read or commented here over the time that the Ottawa Project was active, I just wanted to say “thank you.” I had a great time putting it together, and I hope that in some small way, I was able to contribute to the discussion of urban issues in Ottawa. I’m sorry that I couldn’t maintain it longer than I did, but sadly, that’s just how these things work out sometimes. So once again, thank you, readers, and if you’re still out there, I hope I see you elsewhere online. Well, it’s been a while, and for that, I apologize. For whatever reason, I just haven’t been getting around to blogging over the past few months, but I’ve decided to make a return to form and start posting content again. For today, I thought I’d get away from the big issues, quite literally, and look at a couple of little details that could make Ottawa a better place. For starters, there’s this post on the OC Transpo Livejournal community, which talks about how the City is potentially not scheduling its hybrid buses effectively. As the poster notes, there are more than enough buses to cover the downtown and core routes where they’d be most efficient, yet it seems they are not always being used on those runs. To me, it seems like it would be a relatively simple task to prioritize hybrids for those runs, so why isn’t OC Transpo doing so? I certainly don’t have the answer, but it would be nice to know their justification. My second item for today is an even smaller one, but it could be seen as emblematic of a larger issue. I was crossing Elgin Street recently at Slater, and as I dashed across the last section to beat the sudden onset of the flashing hand, I began to wonder why all the crossings on Elgin from Laurier to the north are so poorly timed for pedestrians? Granted, that part of Elgin is one of the few places in the City with good pedestrian islands, but the crossings are done so that when the “Don’t walk” begins to flash, even a quick walker only has enough time to reach the island before the light changes. The problem here is that, generally speaking, you should have enough time to fully cross the street when the signal begins to flash. Instead, if you begin crossing at that point on Elgin, you’ll find yourself stuck in the middle of traffic, forcing you to wait for at least one full traffic cycle to finish crossing—more, if you want to cross the perpendicular street, too. I believe it’s something the City should look into changing, or that they should at least consider installing countdown signals there, so that pedestrians won’t be surprised by the quick timing of the change. It would certainly be a big help towards improving one of the most unfortunately pedestrian-unfriendly streets in downtown Ottawa. My question to you, then, reader, is what little things do you notice that could improve day-to-day life in Ottawa? I’m sure we all encounter them, and I’d love to hear what your ideas are. 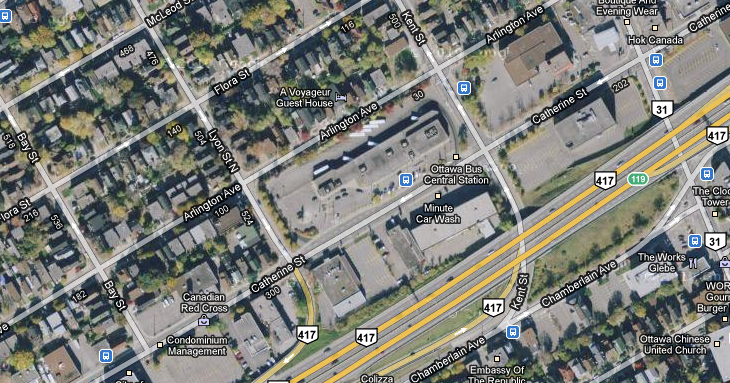 Last week, Ottawa Mayor Larry O’Brien made a rather bizzare, out-of-left-field proposal: to move Ottawa’s current Greyhound terminal from it’s current Catherine Street location, to out by the VIA Rail station on Tremblay Road. Naturally, this was met with some protest. While the current intercity bus terminal is far from the nicest facility in the world (it’s probably about five years overdue for a big renovation), it’s certainly well-located. It’s downtown, served by several major OC Transpo routes (including the 101, which is considered to be rapid transit), and is close to the 417. It’s not perfect, as it could probably stand to be a bit closer to the CBD, and perhaps have better non-peak transit service, but it’s still within walking distance for residents of Centretown, the Golden Triangle, the Glebe, Chinatown, and so on. Additionally, the central location leaves it fairly equidistant (or at least as much as that’s possible) from Ottawa’s various suburbs. The train station, on the other hand? Well, it’s pretty suburban—if you’ve ever tried to walk there, you know that the area makes pedestrians feel like a very distant afterthought. I think the only people that would be able to walk there would be residents of a small residential area a few hundred metres west of the station. Certainly far fewer people than the tens of thousands in and around the downtown core. And sure, the Transitway runs right by it, but, speaking from experience, it’s much more of a pain to jam yourself on a crowded 95 with luggage than it is a 4 making its way down Bank Street. The other question I have about this proposal is where would you put the new bus terminal? Let’s take a look at both, courtesy of Google Maps. The Ottawa Train Station. Image is approximately 500 metres across, for reference. Ottawa bus terminal, to the same scale. While it’s pretty plain that the bus terminal takes up a much smaller footprint, it’s not exactly a small facility. It takes up an entire city block, and even as it is, it can get pretty crowded—I’m sure Greyhound would love to have something larger were they to build a new terminal. But if you look at the train station image, there’s not much room for anything even the same size as the current terminal, let alone anything larger. There’s an area between Tremblay at the station’s access road, but that would involve getting rid of green space and a bike path, as well as potentially conflicting with the reconstruction of the Transitway for light rail. One of the station’s parking lots could be removed, I suppose, but I doubt VIA would like that much, and neither takes up anywhere near as much space as the current bus terminal. 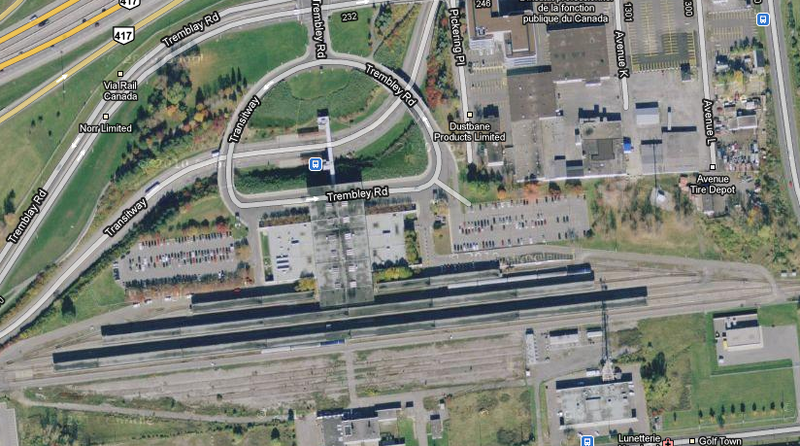 Overall, moving Ottawa’s intercity bus terminal to this location makes little sense. How many people even transfer between VIA and Greyhound? I’d be curious to see the numbers, should they even exist. Not only does this proposal increase sprawl by decentralizing a major transportation service, but I’m not sure it would do anything to improve intercity transit service or convienience in Ottawa. Leave well enough alone, Mayor O’Brien, and keep bus service in the downtown core. Does Terry Fox Drive really need extending? As I browsed through the Ottawa Citizen yesterday, I couldn’t help but notice this article, on the extension of Kanata’s Terry Fox Drive being fast-tracked despite a number of environmental concerns. I instantly knew I had to look it up and attempt to understand why it’s so important this particular project has to be pushed through and I came away baffled. Helpfully, the extension already seems to be marked on Google Maps, so it was easy to get an idea for what the new roadway would look like. As described in the article, it will arc through forest, marsh, and farmland as it makes it’s way from the neighborhood of Kanata Lakes to Morgan’s Grant. And so far as I can tell, it will serve no useful purpose besides creating sprawl and potentially destroying a rare habitat. Not good, to say the least. 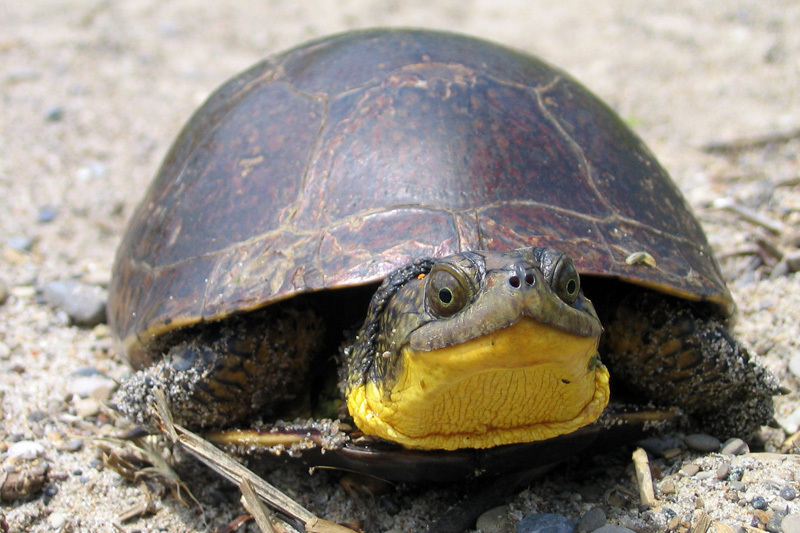 The endangered Blanding's Turtle, which can be found in marshland west of Kanata. Image from Canadian Wildlife Service, by Ryan M. Bolton. I think what we have here is a case of the Greenbelt doing more harm than good for the environment. While I’d rather see the urban boundries of Ottawa’s suburbs frozen where they are for the time being, for growth to be concentrated inwards, it would seem to me that if Kanata has to expand, there are far more suitable areas to the east. There’s a lot of farmland out there, especially north of the 417, land that is for some reason protected, while the land to the west is not. While I hardly advocate paving over farmland for suburbia, it can’t be denied that there is a lot more of it around Ottawa compared to rare turtle habitats. What strikes me about this is that we seem to have some very screwed-up priorities here. Is it really this important to build a shiny, four-lane monument to urban sprawl? Surely there must be some other piece of infrastructure that this stimulus money can be spent on—something that won’t harm an endangered species. That’d be something I could go for. Trains to return to Ottawa’s Union Station? Ottawa’s Union Station: it’s a majestic old building, a half-scale replica of New York City’s old Penn Station, and unfortunately underused. 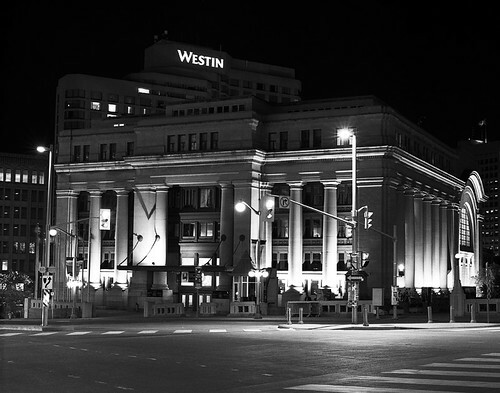 Since 1966, when the National Capital Commission removed rail from downtown, the building has been used as a government conference centre, rather than a hub for rail travelers. However, a recent article on CBC News reported that trains may yet return to Union Station, in the form of a station on the new light rail system—taking the place of the Rideau\Sussex station in the proposal. Ottawa's Union Station. Image by spotmaticfanatic on Flickr. Certainly as it stands right now, Union Station is a tragically under-appreciated piece of infrastructure. As a government conference centre, the average Ottawan has few opportunities to go inside the structure. As the main hall of a transit station, commuters would be able to use this suddenly re-opened public space on a daily basis. But in my mind, that’s not all that could be done with the station. I don’t know the interior dimensions of the building, but I would imagine that a transit station would only take up a small portion of the available volume, and other transportation infrastructure (commuter rail, and intercity bus and rail) probably won’t be able to serve the location, meaning no space would need to be set aside for them. So with that in mind, what could be done? One of the things that Ottawa lacks is a real civic place, one to celebrate Ottawa itself. Over the years as a national capital, the federal government has eclipsed the city, and it’s only been in the last few decades that we’ve really begun to find our identity as a municipality instead of as a capital. So why not this: in our hypothetical, future train station, you walk in the front doors to a lobby, with transit facilities to one side, and perhaps benches and chairs with the odd cafe or two along the edges of the area. Taking up the rest of the space inside could be a City of Ottawa museum, celebrating our history, from rough logging town to major Canadian metropolis. It could even include artifacts that tie in with the location, like the old streetcars OC Transpo is slowly attempting to restore. Granted, we do already have the Bytown Museum, but it could still comfortably fill a role as a museum predominantly about the canal, while the Union Station museum could be about the rest of the city. This, of course, is just a suggestion—a museum is just one option, but the overriding point is that we may have an opportunity to create a fantastic new public space, and the standard option of renting out space for shops and restaurants would be a tragic waste. The simple return of transit, of course, would benefit the building enormously by itself, but I can’t help but feel we could do so much more. These kinds of opportunities only come along once and a while, and I think it’s important to jump on it when and if we can. It’s been a while since I’ve written in here, and for that, I apologize. Once again, life has just had the unfortunate ability to take over. I have written a couple of times for Spacing Ottawa, however, so if you’re looking for my thoughts on urban issues, keep an eye out over there (and for an excellent collection of urban thoughts in general). So what is it that brings me back to blogging? Well, it’s a piano. That’s right, a musical instrument. More specifically, the piano that used to occupy the small sitting area just inside the entrance of Hartman’s, the grocery store that anchors the corner of Bank and Somerset—the only major grocery store in Centretown. Recently, the piano disappeared, replaced by a selection of flowers. There’s been a remarkable amount of outcry beginning to develop on the Internet (especially considering this has only come to light within the last few days), including a Twitter hashtag and a Facebook group. The piano was clearly beloved by regular Hartman’s shoppers, and speaking as a regular customer myself, I can’t help but agree. It added a lovely bit of humanity to the corner of what is, otherwise, a fairly standard grocery-store experience. There was something uplifting and just plain enjoyable about wandering through the store listening to an 80s pop hit or a hymn slowly grow quieter as you moved away from the produce section. It was unique, and made the drugery of walking the ailes picking out groceries a little less mundane. I spoke to a Hartman’s manager who says the piano is still in the store; but will be shipped off to “a charity” soon. I asked if Hartman’s would ensure it ends up somewhere where people in the community could still play it. They were non committal. I asked if any amount of begging and pleading would bring it… back; and he suggests the demand for produce in Centretown is very high and they need the space. Ultimately, Hartman’s is a privately owned business, and they have absolutely no obligation to listen to people tell them to bring back the instrument. However, I can’t help but think that if enough negative attention is brought upon this issue, and if people continue to spread the word and talk about what that piano did to improve the store, then we might have a chance. And certainly, I’ve always felt that Hartman’s had a very good and extensive produce section, certainly as-good or better-than the ones found at the Metro on Rideau and the Loblaws on Isabella. So spread the word. If you’ve ever played the piano, or listened to someone play it while you shop and it brightened your day, then speak up, link to this post or to the Facebook group, or talk about it on Twitter. The more traffic there is on this, the better the chance of the piano being restored to its place inside the store. Even if you’ve been doing nothing but glimpse at the headlines of Ottawa’s major dailies, you doubtless know about the “rising” costs of the City’s light rail plans. With the first phase projected to top $2 billion, the province is starting to get cold feet over helping to fund the project, and it seems like many people are getting antsy over exactly how much the City will have to shell out to get things done. Blue is surface rail, red is tunneled. Train symbols represent potential stations. Map created using Google Maps. In this proposal, rail would follow the Transitway to Lebreton, where it would divert north along the current alignment of Wellington Street—currently used for tour bus parking, I believe—before diving underground for a short tunneled section at Commissioner Street. A slight curve under Bronson Park would line the rail up with Sparks Street, where it would come aboveground just after Bay. From there, it would run along Sparks with stops at Lyon, Bank, and Metcalfe, before diving back underground to curve around to Mackenzie King and Campus stations. Before I go on, I should say that this is entirely conjecture. I’m not certain if any of these curves or climbs would actually work for LRT vehicles, it just seemed like the most logical way to do things at the time. I think there would be a number of advantages to this idea. Most notably, it would remove nearly a kilometre of tunnel, which, at a guess, would probably shave $60–70 million off the bill, along with allowing for surface stations instead of underground stops, also representing a significant savings. Furthermore, I chose Sparks Street for the surface section for a reason: having trains running along that corridor would do a lot to improve the liveliness of that half-abandoned pedestrian mall, giving people a reason to be there outside of office workers on their lunch breaks. Of course, there would be obstacles. The National Capital Commission would of course be reluctant to allow trains on Sparks, something that would need to be heavily negotiated. And it still wouldn’t be cheap, just somewhat less-expensive, so it would hopefully be more palatable to the McGuinty government. Sparks is not the only option for surface rail, either. Albert and Slater could theoretically be used, as they are now, however I think it would be difficult to remove the need for tunneled sections entirely. If the current Transitway lanes were used, leading to the Mackenzie King Bridge, then an extremely tight turn would be required to align trains up for the run to Campus station. Either a tunnel would be needed to make a more gradual turn, or a serious reconstruction of the area around the east end of the bridge would be necessary. In all, while it would require a lot of work and a lot of inter-agency co-operation, I think Sparks Street is the most logical place to build a section of surface rail, if we decide it’s neccessary to reduce the plans cost. At this point, I think it would be premature to scrap the current tunnel plan entirely, but it is at least worth considering our alternatives.